Vauxhall Opel 1.7 D, 1.9 D, 2.0 D M32 Gearbox 3rd 4th gear kit 56/47 Teeth O. Vauxhall, Opel, Alfa Romeo, Fiat Petrol M32 6 speed gearbox 3rd 4th hub kit. 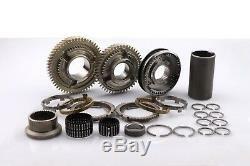 M32 3rd 4th gears 56 x 47 kit Opel Vauxhall Astra Insignia Zafira. Compatible with the following vehicles. Astra 1.7 D / 1.9 D, years 2005 > 2011. Insignia 2.0 D, years 2008 > 2011. Zafira 1.7 D / 1.9 D, years 2005 > 2011. Fits models manufactured up to year 2011 with M32 top casing casting number 55192042. This Kit contains the following parts. 1 x 3rd gear 56 teeth. 1 x 4th gear 47 teeth. 1 x 3rd 4th gear synchro hub. 2 x 3rd 4th gear 3 piece synchroniser rings. ON MONDAY-FRIDAY ORDER BY 17:15 FOR SAME DAY DISPATCH! WE ARE NOW OPEN ON SATURDAYS! We stock many Manual, Automatic and Commercial parts that are not yet listed. WE ARE EUROPE'S NO. We have gearbox experts standing by ready to help with any enquiries you may have with manual or automatic gearboxes. Order before 17:15 for same day dispatch. The item "Vauxhall Opel 1.7 D, 1.9 D, 2.0 D M32 Gearbox 3rd 4th gear kit 56/47 Teeth O. M" is in sale since Tuesday, February 20, 2018. This item is in the category "Vehicle Parts & Accessories\Car Parts\Transmission & Drivetrain\Gearboxes & Gearbox Parts". The seller is "one-stop-gearbox-shop" and is located in Harlow. This item can be shipped worldwide.